On this week’s show we power through technical difficulties to bring you our interview with Kelly Sue DeConnick, writer of the upcoming Captain Marvel series and Ghost from Dark Horse! She tells us about how a note to Neil Gaiman kicked off her career, why you can’t really get a literal translation of manga, her transition from manga adaptations to superhero comics, exactly how she feels about continuity and a ton more! Plus, we answer not one but two questions from the War Rocket Ajax Mail Rocket! Follow Kelly Sue on Twitter and check out her website! Hey, remember that time Ghost made out with Barb Wire? The Dark Horse website does. If you don’t know the ghost bros. Check out the list of anti-heroes on Kelly Sue’s Tumblr! Once you read up on the whole thing, it’s nice to know that Marcus will be a broccoli person. Here’s Chris’ roundup of the minicomics he got at the Fluke convention! Atomic Robo writer Brian Clevinger joins us for his third appearance on the show this week! We’ll hear about his inaccurately titled Real Science Adventures series, why his all-ages Captain America was cut short, his work experiences (or lack thereof) at DC, who’d win in the struggle between Robot Dracula and Robot Santa Claus, and much more! Plus, we give some celebrity big ups! Follow Brian on Twitter and be sure to check out Atomic-Robo.com! Acquaint yourself with the art of Gurihiru. 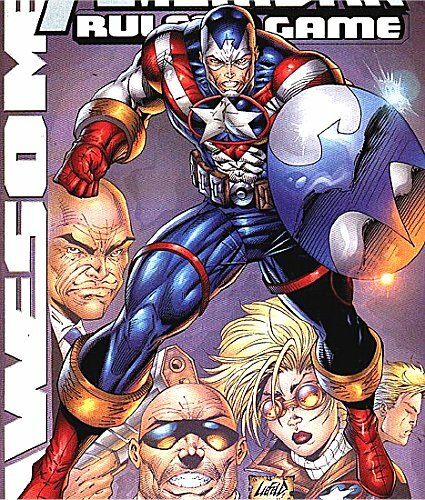 Remember Rob Liefeld’s “Fighting American?” If not, here’s a look. The Supervillain Handbook comes out this Wednesday! Let’s get those Amazon rankings up! Here are Matt’s pictures from C2E2 and here’s his now-infamous Shia LaBeouf review. Famed cop fighter David Marquez, also the artist of Fantastic Four: Season One and Ultimate Spider-Man at Marvel, joins us for the show this week! We’ll hear how he transitioned from animation to comics, how he jumped to such high-profile projects at Marvel in less than two years of pro work, how he draws The Thing, Sue Storm’s powers, types of jam and much more! Plus, Matt and Chris address the controversial ending of Mass Effect 3! Our thoughts may shock you! Follow David on Twitter and check out his DeviantArt site! Here’s that Kotaku article about David’s girlfriend having a “bigger” gamerscore than him. If you don’t remember what the animation in A Scanner Darkly looked like, here’s the trailer. Turns out, Matt had the stuff about Ben Grimm’s teeth backwards. Byrne drew ’em, Kirby didn’t. Enjoy The Ultimate Warrior’s insane ramblings about lawnmowers. This week we welcome back the writer of Archaia’s Cow Boy and co-writer of Image’s Pigs, Nate Cosby! We get into how he transitioned from editing all-ages comics at Marvel to writing the salty language of Pigs, how Cow Boy isn’t the comic you’d expect, how working as an editor affected his collaboration with artists, the true modern poetry of Freak Nasty, and much more! Plus, we enjoy a listener’s description of the wonders of the Batman arena show! Nate’s on Twitter! And if you haven’t read Cow Boy, a big hunk of it is available to read here! Freak Nasty. “Da Dip.” Enjoy. The Angry Video Game Nerd reviewed Silver Surfer for the NES. It is awful. Mourn you ’til we join you, Dixie Carter. Remember U.S. Acres? We do. The Batman Live arena show: Catch it! Watch closely and you’ll see CM Punk in John Cena’s Wrestlemania 22 entrance. Some family emergency stuff made it impossible to record this week’s show, but we’ll be back next week. And be sure to check out the Ajax Classic episode going up on iTunes today!